I just picked up a Claymore Crate from GI Bricks to review and Julie sent me the other two packs as well. All of these packs come with a BrickArms crate with special printing and four BrickArms weapons painted by Brick Mercenaries. They are available exclusively from GI Bricks. 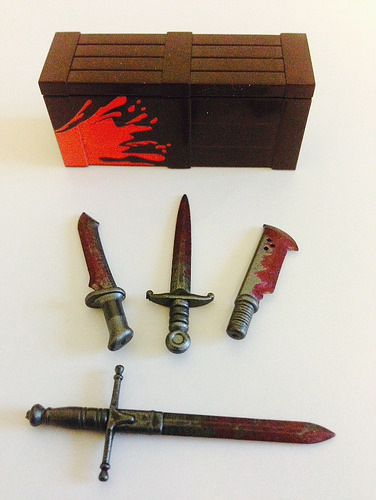 This pack comes in a brown BrickArms crate with a splash of red blood printed on one side. The printing is very nicely done, as we have come to expect from BrickArms. The crate itself would actually be quite useful in a battle scene, perhaps with a slain minifig leaning against it. The pack includes a Claymore, Damien Blade, Havoc Blade and Killstrike Saber. What makes these weapons really special is the paint job by Josh Baum of Brick Mercenaries. The paint looks professionally done and he was able to recreate an accurate representation of blood-soaked weapons, rather than randomly applying red paint, as is so often done. The paint also feels very durable. On the GI Bricks website, it says that these are for display purposes only, but I think they would stand up to light play. They will get scratched up if left in a bin with other weapons, but normal handling isn’t going to affect them. This pack comes in a bronze BrickArms crate with “puff” painted dragon lock and rings. This crate is my favorite of the three. The paint and design are exceptional. This crate will fit in very nicely in a medieval or fantasy scene and be a highlight of any creation in which it is used. The pack includes four Claymores, each painted a different color. The color design here is very unique. The point of each weapon starts with white and fades into one of four colors (Purple, Blue, Green and Red). The color then fades into black at the hilt. Again the quality of Brick Mercenaries paint job is exceptional. Any one of these four weapons would be right at home in a fantasy or science fiction creation. Like the weapons in the Bloodshed Crate, the paint on these feels quite durable and will not be easily scratched. 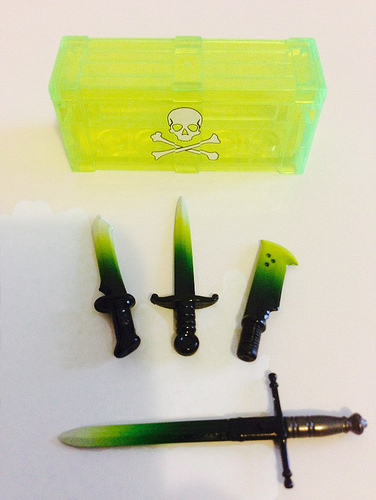 This pack comes in a transparent neon green BrickArms crate with a skull and crossbones printed on it. The printing is very high quality and the crate would be at home in a modern or science fiction creation, though less so in a medieval/fantasy build, due to its’ transparent nature. 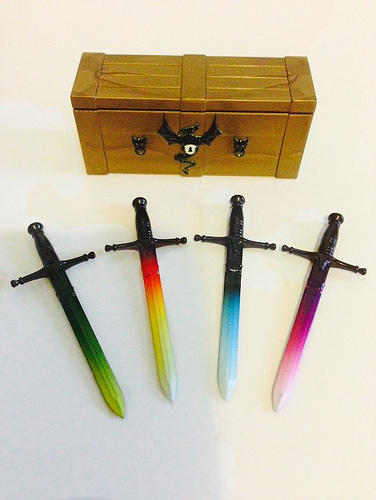 It comes with the same assortment of weapons as the Bloodshed crate and all are painting with the same fading color scheme as the green Claymore in the Claymore Crate. Having four different weapons, all matching like this, is a very nice feature. You could build a small squad with matching magical weapons or display them on the wall of wizard’s workshop. Again, the paint is done exceptionally well. The only issue I noticed was that the Havoc Blade had some excess overspray on the hilt. However it didn’t effect the use of the weapon and is not noticeable unless you are examining the piece very closely. All three packs are currently on sale at GI Bricks for 20 USD. I think the packs are well worth the price. You get an exclusive, hard-to-find crate and four weapons customized by a professional artist, who is well-rehearsed in the painting of customized weapons for LEGO figures. You do have to remember that, due to the handmade nature of the weapons, there will be slight differences from pack to pack. Your weapons will be similar but not identical to the ones in my pictures. While the Claymore Crate is my favorite, all of them come with useful color schemes on the weapons and awesome printing on the crates. If you are into unusual items from 3rd party manufacturers or just want something unusual in you fantasy and science fiction builds, you should pick up one or more of these packs!